For a fourth consecutive year, I asked three of the foremost CFF enthusiasts—Mike Bainbridge, Justin Heisey and Thor Nystrom—to join me and vote on their top three college stars in four categories. The results are totaled, and the elite fantasy performers in college football for the 2018 campaign are listed below. Excelsior! Kyler Murray, Oklahoma: The Sooners’ signal caller tops my ballot in a close call over D’Eriq King. King not taking home the trophy is hardly his fault — he was on track to end the CFF season as QB1 before he suffered a torn meniscus in his right knee in Game 11 against Tulane. That injury stole his final six quarters of regular season football (including, most unfortunately for his owners, Week 13, which is CFF championship week for most leagues), allowing Murray to sneak into pole position. Murray was a force all season and then combined for nearly 100 fantasy points in Weeks 12 and 13, swinging playoff matchups in many leagues. For my third choice, I went with McDonald, who finished QB #6 in standard CFF scoring but provided an absurd return on investment for anyone who threw a dart on him late in their August drafts. Dwayne Haskins (who had a few down games but was dominant in most others), Gardner Minshew (a season-long revelation after winning Wazzu’s QB job) and Taylor Cornelius (who averaged over 31 fantasy points per game despite all the turnover along Okie State’s offense) are other worthy choices worth mentioning. Had Tua Tagovailoa played anywhere near the entirety of Alabama’s 48 regular season quarters, he may have topped this list. But alas his owners ironically became victims of his and his team’s dominance. Darrell Henderson, Memphis: The Barry Sanders Award for the best fantasy running back certainly gives a huge name for the winner to live up to. The great Barry Sanders still holds single-season records for average rushing yards per game, rushing yards, and rushing touchdowns. The person that I have selected to win this prestigious award is none other than Memphis’ Darrell Henderson. Henderson blew up this season after being drafted later than the fourth round in most leagues. Henderson racked up the second-most all-purpose yards (1,915), fifth-most yards per carry (8.74), and second most rushing touchdowns (17) this season. What is incredible about this is that Henderson’s touches were far less than other prominent backs like Jonathan Taylor and Eno Benjamin who had well over 250 carries while Henderson only received 174. Henderson has one final year of eligibility left, and if he returns to college football next season, he will be an unquestioned first rounder in 2019 fantasy drafts. Andy Isabella, Massachusetts: Had Laviska Shenault remained healthy for the entire season, he likely would have been No. 1 for me, but the three games missed in the second half of the year hurt his overall production. 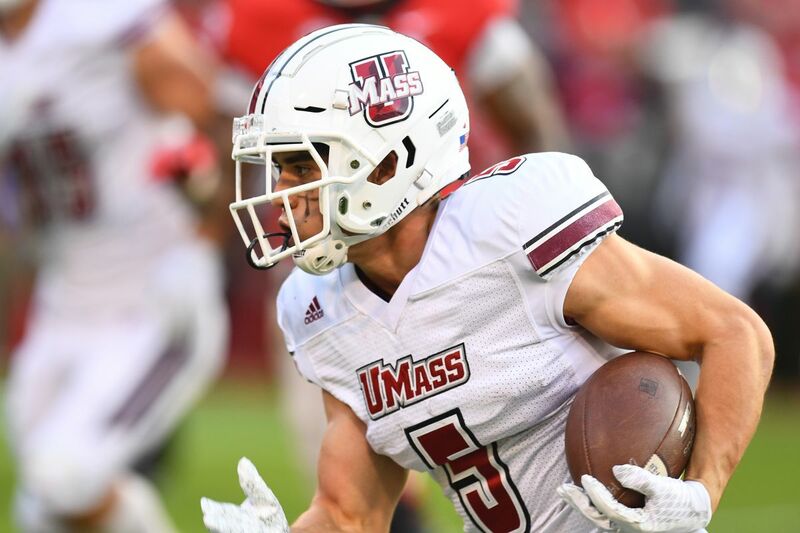 Andy Isabella finished first in the country in fantasy points scored amongst wide receivers and had, far and away, the highest points per game average at 25.89. Despite playing with multiple quarterbacks throughout the season, Isabella still finished with a career-high 1,698 and 13 touchdowns. The two highlights of the season for him came against Liberty when he topped 300 yards receiving and then his jaw-dropping performance against Georgia where he finished with a 15-209-2 stat line. Just an incredible year for Isabella.